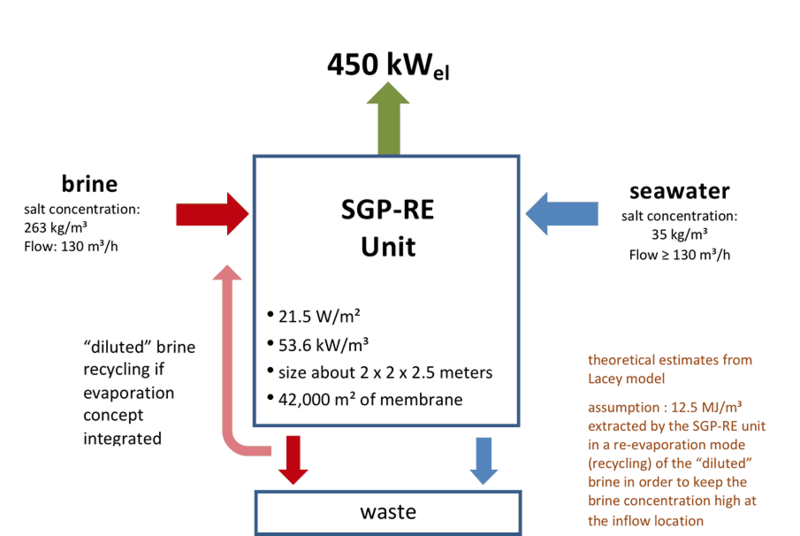 The objective of REAPower is to prove the concept of electricity production through Salinity Gradient Power- Reverse Electrodialysis (SGP-RE) using brine and sea or brackish water and to develop the necessary materials, components and processes. The SGP-RE is a clean, renewable energy with large global potential since the electricity is produced simply from supplies of water with different salt concentrations. Theoretical calculations, assuming similar conditions to the salt pond where the first RE stack for brine and seawater reverse electrodialysis will be installed, show that the theoretical osmotic energy content of 18,8 MJ/m3 of brine could result in a power output of 450 kWe generating electricity at very attractive cost as illustrated in the following (arbitrary) example.